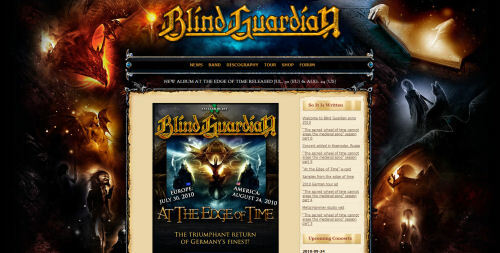 The official website of the group changed its skin for the release of new album At The Edge Of Time, one finds of course the usual categories such as discography or profiles of all members (which are yet to be completed), the biography has been update and the news system has been completely redesigned, no more pop-up! And obviously it's a whole new skin is being proposed here with a lot of graphics elements unknown, it could resemble the inside of the booklet of At The Edge Of Time because it will be fully illustrated, as Felipe Machado Franco says in his interview. And finally, a new concert in Russia has been planned at Krasnodar the november 2nd, 2010.